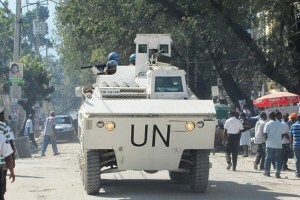 PORT-AU-PRINCE – The United Nations Security Council will officially vote tomorrow on closing the 13-year-long peacekeeping mission in Haiti as recommended by UN Secretary-General Antonio Guterres. Outlining recommendations contained in Guterres’ report, Honoré said Haiti had made significant progress in consolidating democracy and maintaining security and stability with the inauguration of Jovenel Moïse as President on February 7, marking the restoration of constitutional order. Yet, she said, in spite of those gains, pockets of fragility persisted and political challenges remained. Honoré said it was time to reshape the partnership among the international community, the United Nations and Haiti, with a view to monitoring concerns such as human rights issues and ensuring that progress made since MINUSTAH’s 2004 establishment endured. With the Council’s support, a joint transition plan would guide the handover, underpinning the gradual transfer of tasks to the Government, the international presence and the United Nations country team, thereby paving the way for the closure of the peacekeeping chapter in Haiti. Honoré said a six-month extension to MINUSTAH, set to expire on Saturday, would encompass a drawdown and the creation of the new mission, which would unfold against a backdrop of a significantly improved political outlook. Delegates, including troop-contributing countries, expressed broad support for downsizing current operations. There are currently 2,342 troops on the ground in Haiti.